This is a one of a series of interviews with pioneers who built the Ecological Reserves System. The Ecological Reserve elders’ interviews are part of the legacy of the BC’s Protected Areas organized by Friends of Ecological Reserves. 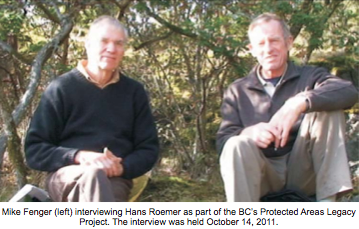 This is a transcript of an interview held on October 14, 2011 with Hans Roemer, in part made possible by a grant from the Community Legacy Fund, BC Parks Centennial to Friends of Ecological Reserves. This interview took place in the Garry oak forest that surrounds Hans Roemer’s home. These videoed ER elders’ interviews will be available thanks to the archives managed by the Elders Council for BC Parks (http://www.elderscouncilforparks.org/ ). Mike Fenger (MF). I am here with Hans Roemer to find out a little bit about the early days in Ecological Reserves and the role he had with ERs. Hans first we’d like to know a little bit about how you became interested in ecosystems and ecology? 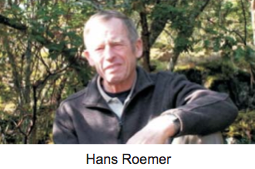 Hans Roemer (HR): I became interested in ecology actually long before I came to Canada. After one year as a research assistant, I started on a PhD at the University worked in the natural environment in forest ecology and was interested in the Ecological Reserves program as well. I became acquainted with the ER Program in 1973 and have been with it virtually until I retired. MF. You mentioned that you came here and then did your PhD. Where did you come from? HR. I came from Germany and had a degree that was equivalent to a Masters Degree in Landscape Ecology and came to Victoria and did a dissertation on forest ecosystems on the Saanich Peninsula, basically southern Vancouver Island. I attended the early meetings of the so-called Reserves committee. This was a big crowd of scientists, foresters and biologists from all over the place. MF. Did you intend to stay in British Columbia or were you planning to go back to Europe? HR.As a matter of fact I did go back to Europe later for 2 1⁄2 years. After my father died, we had to get a lot of things in order, but I basically had the intention of coming back. I came back in 1978 and I was offered the Ecological Reserves job which was vacated by Dr. Jim Pojar. After some sorting out of immigrant status and citizenship I became the ER ecologist. MF. So it’s fair to say you were seduced by BC ecosystems and came back to work on them. HR. That is putting it quite correctly. If you work in an area long enough in the natural environment you become attached to the place. MF. You mention that you took over from Jim Pojar. What did that involve? HR. I continued in the same fashion as Jim Pojar which was going out and surveying potential ERs and looking for pieces that would fit the puzzle. MF. What were you looking for? HR. As a plant ecologist I was looking for original native pieces of forest that were undisturbed, especially for those ecosystems that were already becoming uncommon at that time, like the Coastal Douglas Fir zone where logging was very big in the decades before and only a few places remained, even at that time, that were undisturbed and deserved ecological reserves status. MF. And when you found these areas how would you advance them to become ecological reserves? HR. They would be described in words and their outlines put on maps and put into a proposal package. At that time we used the International Biological Program (IBP) form which was used widely in other countries as well. Those forms were completed to describe the natural environment, the geomorphology, the vegetation, wildlife, special features etc. This IBP form, as we called it, together with additional descriptions were passed on to the land managers whose responsibility it was to circulate these proposals to the various stakeholders, the Ministry of Mines, the Ministry of Forests and the wildlife biologist in the Ministry of Environment. This wasn’t happening over night – it was taking quite a long time. They were modified or disapproved, which happened very often, or they were approved which happened very rarely. MF. When you began, can you remember how many ecological reserves had been established? HR. Actually quite a number, in the order of 100. MF. You mentioned Jim Pojar. Were there a number of people you worked with at that time? HR. I actually didn’t work that much with Jim as he had left. Bristol Foster was the ER coordinator and Director of the ERs. There were a number of temporary people and Trudy Carson, now Trudy Chatwin, and later Lynne Milnes. There were summer students off and on. It was primarily Trudy Carson and myself who assisted Bristol Foster. MF: What sort of goals did you have at that time? Did you have targets or could you bring forward areas and proposals as you saw fit? HR: We could bring forward proposals. There were two main goals set on the basis of the Ecological Reserves Act. One was to protect representative ecosystems. These were ecosystems that are widely distributed and have a fairly large range such as ecosystems in the different biogeoclimatic zones and subzones; and the other was to protect special features for wildlife, vegetation, rare plants, geologic features such as unusual rock formations and cave ecosystems. That kept usbusy. MF. You must have travelled to all parts of BC. HR. Yes I did travel quite a bit. I travelled to places where we never ever did get any representation. I travelled to the center of the province where we already had the odd ecological reserve and we added some there. I traveled to the eastern corner but I never managed to come near the northern border of BC but it did happen later. MF. You started in 1978 and carried on for a number of years. How long were you with the ER program? HR. I worked directly for the ER program for 17 years and after that I was still responsible for Ecological Reserves but others were too. It was (1993) when the administration of ERs was put under BC Parks leadership. MF. So that was the end of the independent ER Program? MF. I wonder if there is anything that stands out from that time, some adventures, something that you would like to share that you remember with fondness? HR. There were many places we were fond of that really cried out for protection. I remember the people. It was a privilege to do this. What stands out I really don’t know. I remember one time we were up in the McGregor River area and were surveying a transect that went from river flats through wetlands, up slopes to a mountain top. When we got up there we looked back down and there was a big grizzly bear with two cubs. The mother, presumably it was the mother, was teaching the two cubs how to catch ground squirrels. She would dig them out and let them go and the little ones would pounce on them and catch them again and so on. That was quite delightful. Many such adventures happened during work and I enjoyed them. MF. You stated there were many areas where you weren’t successful. What were some of the challenges you faced and that might still be there today? HR. There were challenges to get ER proposals through the process. It took very long usually. I just looked at the list of ERs and noted a proposal that Jim Pojar originally made that took 32 years to become an ER in the Smithers area. Many proposals that I made never saw the light of day as reserves. They got bogged down in the referrals. There were too many objections. If it was a forested area it was forestry concerns to take it out of production. In other areas it was mineral potential, in fact mineral potential was the greatest obstacle of them all. Even if there was the mere potential not even an occurrence and nothing proven, it could be turned down and it happened very often. MF. What was the role of Friends of Ecological Reserves in those early days? I am thinking maybe this role has changed over the years. HR. I knew volunteer wardens did some monitoring of what was going on. You had to operate at a distance from the Friends, so I never knew much of what they did. MF. Have you got some advice you would offer for government? HR. I would offer to try and re-establish something like the advisory board in a fashion so that you could get really specific recommendations on ecological reserves. We have an example recently that you are aware of. Management in one of our most precious ecological reserves was such that people were horrified. There are other ER management cases where activities are border line and there are cases where management should be looked at by more than the officer in charge of the ER and the warden. They should be looked at by people with scientific know how and experience. MF. Do you have any thoughts on managing succession and natural disturbance in ERs? there are special cases. Take the case of Nimpkish Island. We had a fairly large proposal in the beginning, about 300 acres and in the end we had about 40 acres on an island. There are advantages to being on an island for a small ecological reserve. This island was in the Nimpkish River and it was subject to channel changes, bank erosion and blow down because the surrounding areas had been clear cut and so after the government had spent a million dollars to acquire this island, or rather, spent the money to acquire the timber on it, we started to lose the trees. This meant some effort to protect the reserve from being washed away was appropriate. We made various attempts to stabilize the banks, later deepened some channels to lead the water away. What else could you do after you spent a million dollars for a piece of forest? Those are hard choices. MF. Was the science panel involved with Nimpkish Island and deciding what to do? HR. No it was not because it was abolished before that. The Minister in charge earlier, in fact quite a few years earlier, in the late 1970s or early 80s, decided that he didn’t want this advisory panel any more. So it was abolished. It was a very valuable part of the ecological reserves system because in cases where staff are too close to an issue, it is very necessary to have some outside advice. to this lovely Garry oak site where we are sitting. HR. These things are a matter of degrees. No objections arose against 20 years of broom management in the Mount Tzouhalem ER but some Douglas fir in-growth has been managed or started to be managed or stopped in this same ER and everybody is horrified. These things could be averted in some cases by pre- existing rules. There is also an issue of what kind of ER it is. If this is a representative ER, then it could be left alone and there are no objections to going through successional changes. But it could be another ER where we have so many rare plants that you don’t want these successional changes. Basically trying to arrest successional change is almost a futile attempt, but there are instances where it can be slowed down. The attempt to slow down Douglas fir in-growth met with very major objections. MF. So some management of invasives is within the scope of management of an ER? HR. It is a much easier decision with the invasive plant species than with natural vegetation such as the Douglas fir which had been there before and which is coming back. Because this ER has been selectively logged a long time ago. These issues should be outlined and discussed before we go and do something and they should probably be discussed and outlined for each ER prior to management because every case is different.